[149 Pages Report] The global sensor hub market was valued at USD 9.87 Billion in 2016 and is expected to grow at a CAGR of 18.9% during the forecast period. The factors such as the significantly growing need for low power generating solutions, steady growth in the number of integrated sensors in smartphones, and increasing use of 6-axis and 9-axis sensor solutions or use of sensor fusion within devices are expected to drive the growth of the sensor hub market. The base year considered for the study is 2016 and the forecast period is between 2018 and 2023. The objective of the report is to provide a detailed analysis of the sensor hub market, based on processor type, end-use application, and region. The report provides detailed information on the major factors influencing the growth of the sensor hub market. The sensor hub market ecosystem comprises interface manufacturers, system integrators, and distributors. Players involved in the development of sensor hub include Microchip Technology Inc. (US),, STMicroelectronics N.V. (Switzerland), Robert Bosch GmbH (Germany), NXP Semiconductors N.V.(Netherland), RoHM Co. Ltd. (Japan), Analog Devices, Inc.(US), InvenSense, Inc. (US), Infineon Technologies AG (Germany), and Memsic, Inc. (US). This research report categorizes the overall sensor hub market by processor type, end-use application, and region. 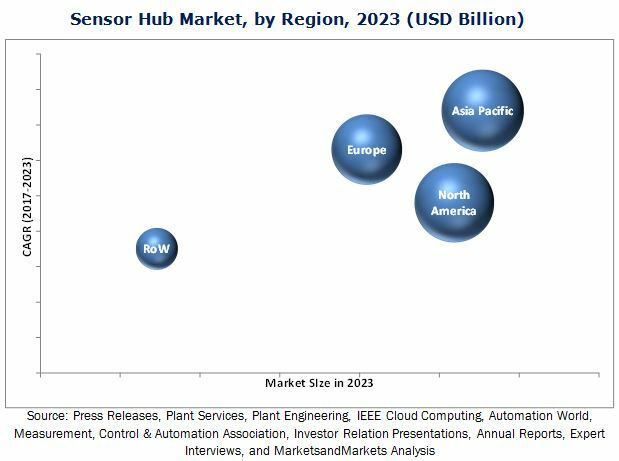 The sensor hub market is expected to reach USD 32.53 Billion by 2023, at a CAGR of 18.9% between 2017 and 2023. The growth of this market is propelled by the steady growth in the number of integrated sensors in smartphones, the need for a low-power solution, and the use of sensor fusion in devices. The discrete sensor processor dominated the sensor hub market in 2016. This dominance is attributed to the use of discrete sensor processor hubs in wearable devices as well as the higher power saving advantages offered by this processor type. The application sensor processor is expected to hold the largest size of the sensor hub market during the forecast period as it is being deployed by a large number of smartphone manufacturers such as Apple, Inc. (US). The consumer electronics end-use application is the largest market for sensor hubs. This growth is attributed to the extensive use of sensor hubs in smartphones, tablets, smart TVs, wearables, and gaming consoles. All these devices use sensors for different activities such as gesture recognition, image stabilization, navigation, motion-based gaming, and health monitoring. North America dominated the overall sensor hub market in 2016. Owing to the rising awareness for driver's safety and influence of regulations and safety ratings for original equipment manufacturers (OEMs), the system such as advanced driver-assistance systems (ADAS) is highly adopted by automobile manufacturers, thereby driving the growth of the sensor hub market in this region. The US is an important market in North America that provides sensor hub solutions to OEMs of consumer electronics and automobiles. North America is an important hub for consumer electronics products, especially for smartphones and wearable devices, which prominently use the sensor hub technology. This region has the highest number of end users for healthcare wearable devices. Technical complexity in sensor hub deployment is one of the major challenge witnessed by the sensor hub market. There is a need for advanced technical expertise for the effective deployment of sensor hubs in products. Thus, emphasis needs to be given on the ease of integration of sensors with microcontrollers as well as complete sensor hub systems for the growth of the sensor hub market. Market players such as Microchip Technology, Inc. (US), Inc., NXP Semiconductors N.V. (Netherland), STMicroelectronics N.V.(Switzerland), Robert Bosch GmbH (Germany), and Intel Corp (US) are focusing on product launches and developments, mergers, acquisitions, and collaborations to enhance their product offerings and expand their business.